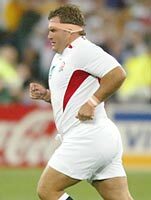 Veteran England prop Jason Leonard set a world record for Test appearances when he came on for his 112th international in the World Cup semi-final against France today. Leonard, 35, started the game on the bench, but came on in the fifth minute to replace Phil Vickery, who went to the blood bin. Leonard's brief appearance saw him take sole ownership of the world record he had previously shared with former French centre Philippe Sella. Leonard, who made his Test debut against Argentina in 1990, has also played five Tests for the British and Irish Lions, but they do not count in his England total.